If you love cooking with meat, I’m sure you’d appreciate the added flavors that you can enjoy when you use a fine meat injector. Meat injectors have easily become one of the most enjoyed cooking tools by chefs all over the world because of the way it infuses more flavor to all kinds of meats. Those delicious and complicated flavors you can get from herbs and spices can now be injected in the deeper layers of the meat. If you’d like to ante up your meat game, I suggest you try and take a look at our guide below. You will learn which meat injectors are great for your needs in terms of price, durability and ease of usage. Find out below which products we recommend. 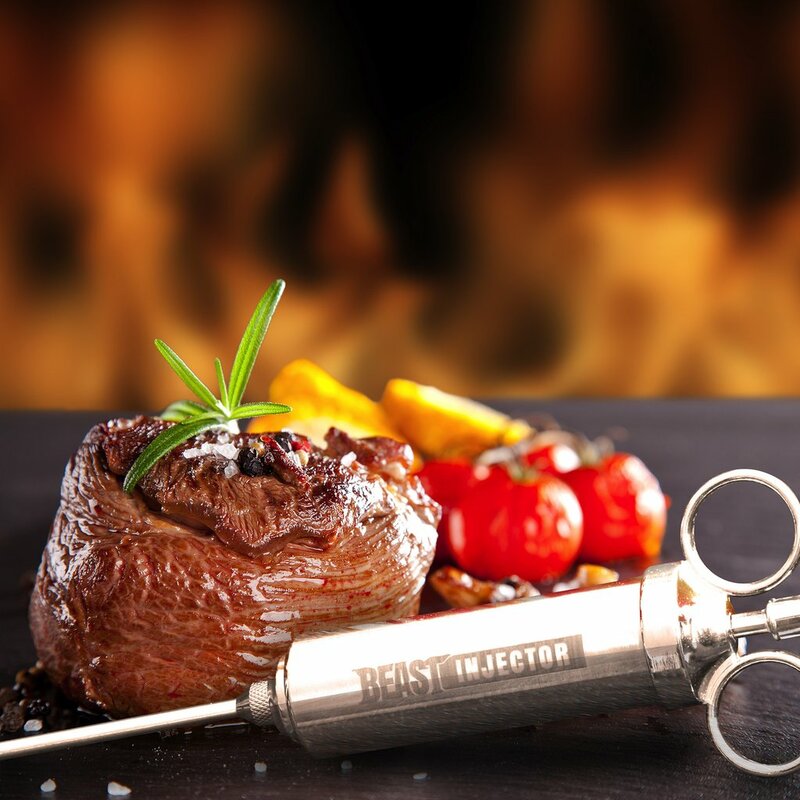 There are a number of benefits you can enjoy when you get a meat injector. The two major benefits you will get to experience is the way you can effectively marinate and add moisture to all kinds of meat. In conventional ways of marinating meats, the mixture of flavors you use usually don’t penetrate deeply into the fibers of the meat. Usually, the marinate just reaches the exterior surface of the meat and not on the inside. Since meat injectors place the flavorings within the meat, the liquid content helps make the meat moist during the cooking process and provides a more flavorful end result. Since meat injectors can help add moisture to any type of meat you cook, it can effectively help you turn large cuts of meat that usually require high heat ﻿﻿﻿temperatures to cook to be served completely juicy on the inside. A meat injector also solves the common issue when it comes to marinating meat, which is that it takes such a long time. At a minimum, you will need about 30 minutes of soaking time for the flavors to stick into your food. With a meat injector, the meat you cook will contain all the flavors of your marinade within mere seconds. You don’t have to worry about forgetting to marinate the meat overnight because a meat injector does that for you in just a few minutes. Meat ﻿﻿injectors are very simple and easy to use. It all begins with your liquid marinade. 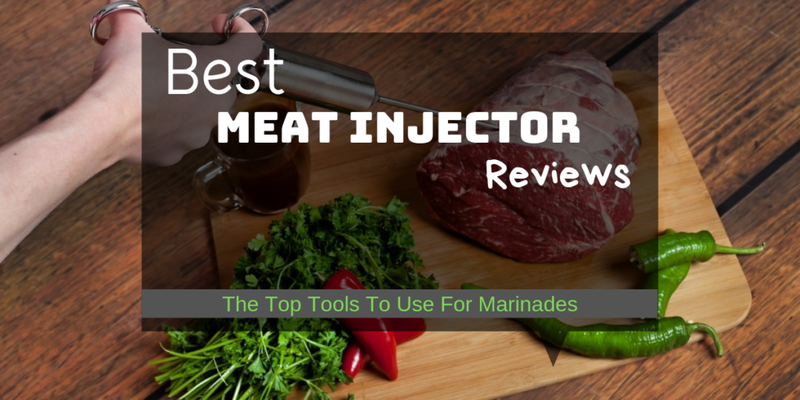 The first thing you need to do is prepare your marinade and fill the meat injector with it. Simply draw your marinade into the injector via its needle. Once the marinade is completely inside the injector’s chamber, all you need to do is stick it into the meat and push the plunger to put the liquid into the parts you wish to become flavorful and moist. 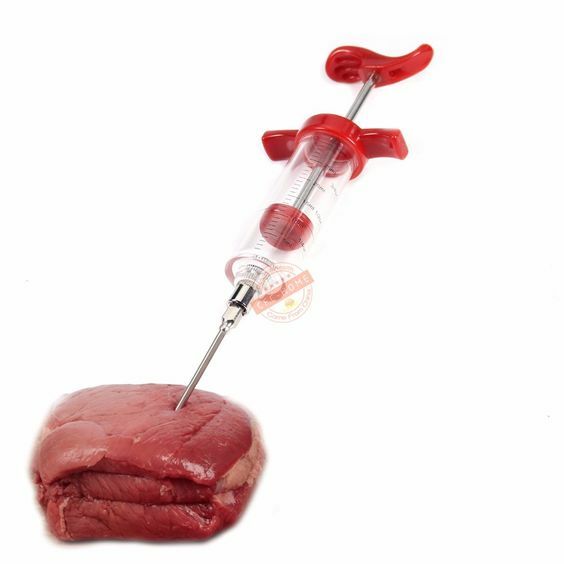 Needless to say, a meat injector is one of those cooking tools that doesn’t require much culinary experience, but it can significantly affect the overall quality of your food. 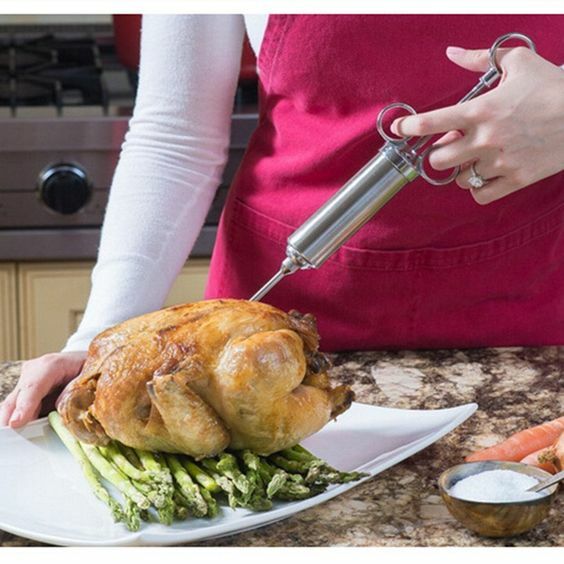 Aside from meats, you can also use a meat injector on other types of food. 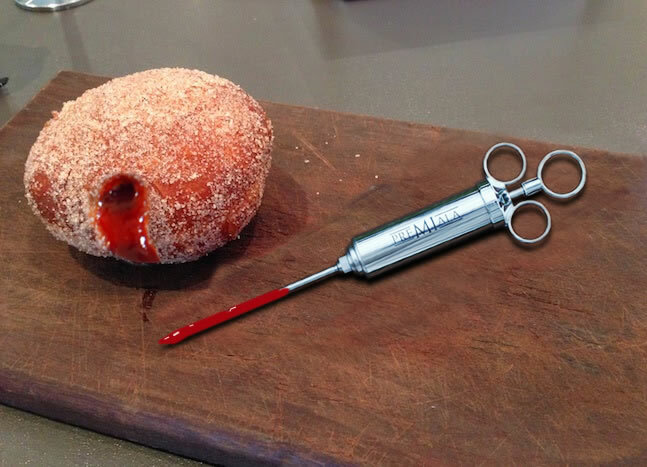 One creative use for a meat injector is of fruits. You can use a meat injector to infuse fruits with chocolate, liquor, or pretty much whatever you wish to add. You can also use it for baking. Infuse syrups or fillings inside pastries like donuts, cupcakes and many more with the use of this nifty gadget. The things you can do with meat injector is practically endless. This is why getting one for yourself can make you a more versatile and creative chef in the kitchen. The first thing you should be mindful of when it comes to meat injectors is the size of its chamber. If you often find yourself working with large cuts of meat, I suggest you get one with a large capacity so that you wouldn’t have to refill it constantly. Do keep in mind that the size of the meat injector chamber can significantly affect how easy it is to clean the whole thing. Injectors with smaller chambers tend to be easier to clean than larger ones. When you look for meat injectors, you will see that some come with thin needles while others have large and wide ones. The type of needle you will need would, of course, depend on the type of marinade you use. If you are using pure liquid marinades, you can do just fine with a thin needle. But if you are using marinades with little chunks of herbs in it, you might as well go with a large wide needle to ensure that bigger chunks of ingredients will be incorporated in the meat effectively. Do keep in mind that the larger the needle you choose, the harder it will be to penetrate the meat. Another important thing you should consider is how easy it is to use. Try to choose a meat injector that you would find easy to grasp and maneuver. Also, try to choose dishwasher-safe meat injectors to practice proper hygiene. Take a closer look at our suggestions below. 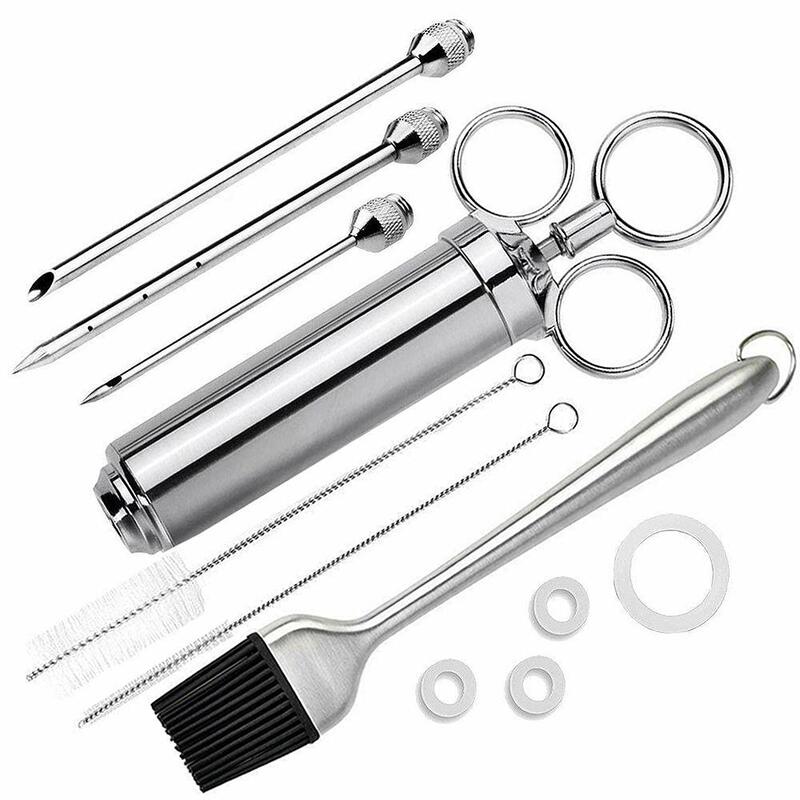 The Luxe Grill Stainless Steel Meat Injector Set is one of the simplest and easiest to clean meat injectors you will find in the market today. This meat injector is completely affordable, but that doesn’t mean it lacks in quality and use. It is actually made from highly durable steel. What’s more is that its overall construction is completely solid. What’s great about this product is that it comes with a pair of needles that you can effectively use to inject both pure liquids and marinades with chunks of herbs in them into meat. It also comes with a slim looking design than most models, which I personally think is a plus. This meat injector has got to be one of the nicest-looking injectors you will be able to find in the market today. Right out of the box this injector can easily be used to effectively marinade all sorts of meat. What’s great about this product is that it’s completely made out of food-grade stainless steel that won’t feel flimsy when you push the plunger down as you inject the marinade into the meat. This meat injector comes with three needles that you can use to inject pure liquid marinades and chunky sauces. It also comes with a 2-ounce chamber that you can use to effortlessly add marinades to small cuts of meat. It also comes with a lifetime manufacturer guarantee and a money back guarantee if you aren’t satisfied with this product. 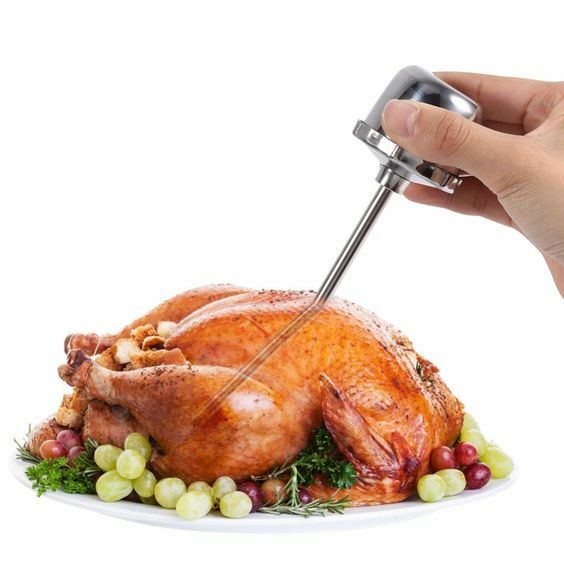 This meat injector comes with a very attractive design and is highly durable since it is made with 304 food grade stainless steel. What’s great about this product is that it’s not susceptible to rust even after years of use. It comes with three needles that you can use for liquid marinades and chunky marinated with herbs in it. If you decide to get this product, you will also get a spare silicone o-ring for easier maintenance and a handy e-book for instructions and recipes. This meat injector is a fine set that comes with a great selection of tools that you can use to cook meat. It comes with 3 differently-sized needles that you can use in both thin and thick marinades. It also comes with a 2-ounce chamber that would make it very easy for you to add flavor to medium cuts of meat. If you decide to get this product, you will also get a basting brush, a thermometer, and a couple of cleaning brushes for easy cleaning. It also comes with a storage pouch for easy storage. Here is another inexpensive product you can add to your cooking tools. It is a meat injector made from 304 food-grade stainless-steel material. It comes with one 2-ounce injector barrel, 3 different marinade needles and a brush. You also get spare O-rings and 2 cleaning brushes for your needles. It basically comes complete with everything you might need to keep your meats injected with loads of flavors. It also comes with a warranty, to bring more peace of mind to buyers. 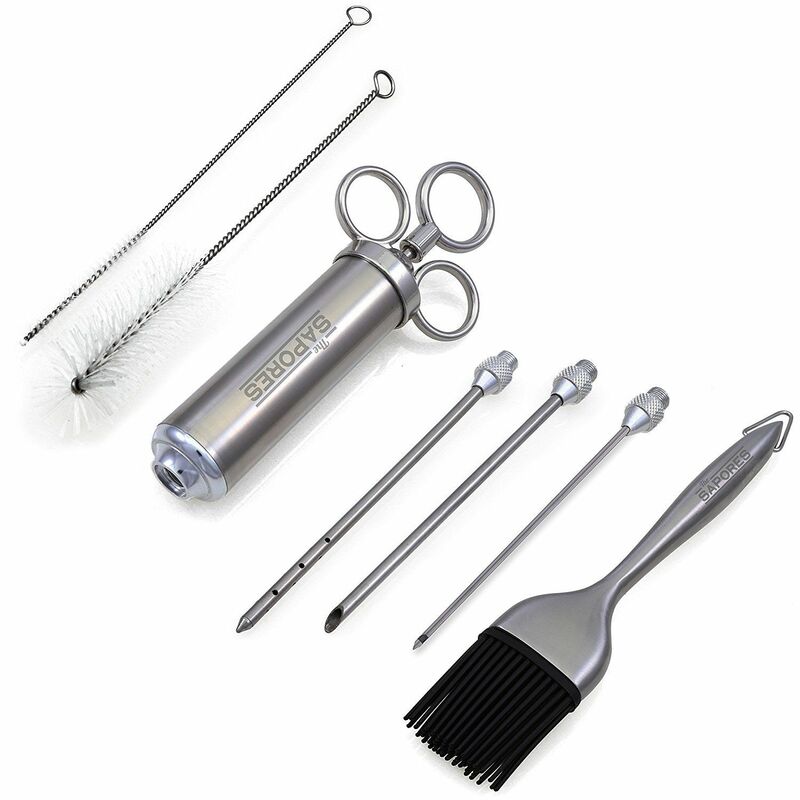 Starter Kit: Luxe Grill Stainless Steel Meat Injector Set. If you are looking for a simple meat injector kit that will get the job done without being too complicated to use or too expensive, this is a good choice for you. It is inexpensive, but it should still last you for a long time. Durable but Inexpensive: Grill Beast Stainless Steel Injector Kit. Get this if you often use tougher kinds of meat. It has durable stainless-steel needles, which will ensure your marinades won’t go to waste and will get injected in the meat properly. 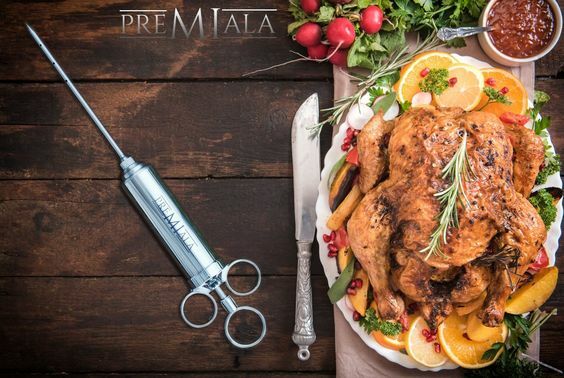 Long-Lasting Choice: Premalia Professional Flavor Marinade Injector Kit. Looking for something that you can rely on for a long time? This is a good choice. It has a durable construction, but it works in injecting different consistencies of marinades into your meat. You can use herbs and spices and not have to worry about the thicker chunks getting stuck in the injector. Price is Just Right: The Sapores Supreme Marinator Set. This product is not too cheap and not too expensive but still offers some quality features. It has a good chamber capacity and durable needle materials that will ensure even tougher meats can be injected with the marinades. Value for Your Money: PCMOS Meat Injector Kit. This is one of the most durable meat injector kits you can buy today. At a very affordable price, you can get an injector kit without spending too much money. It’s an ideal choice for those who are on a tight budget but who will need a heavy-duty injector kit. 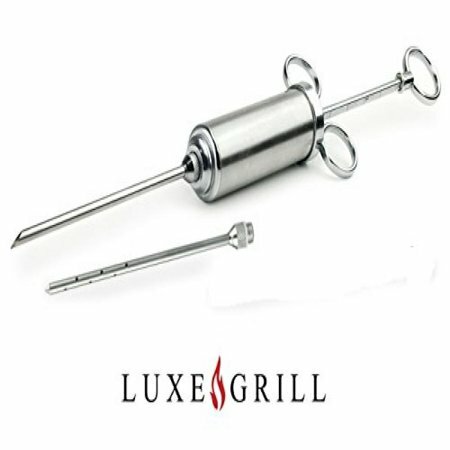 We've chosen one product as the best meat injector of them all - the Luxe Grill - which we love for its affordability, it's durability and its slim design. Make sure you click on the links of the product you think is the best choice for you. You should also check out our homepage to find out which products will help you become a better cook. You can find product recommendations you probably don’t have in your kitchen yet. These products will make cooking and preparing food for your family easier. These products will make you prepare food like a pro.